Unless otherwise noted, the examples in this article use a Slackware 13.37 system with 2.6.37 kernel. The upstart examples use Ubuntu 14.04 LTS with a 3.16.0 kernel. The systemd examples use Fedora 22 with a 4.0.4 kernel. Your results on other systems may differ. Most of the time a Linux system runs as a multiuser system, often as a server with many different processes running under several different user ids. Sometimes it has a graphical user interface and serves mostly a single user, while at other times it is a headless server working for many users. When you need to do some kinds of system maintenance you don’t want all those users trying to get things done, so you need to be able to run the system with a single user rather than many. You also need to switch to this mode cleanly, giving appropriate warnings to logged-in users. And you need to get back into regular operation as quickly as possible. This article shows you how. This article helps you prepare for Objective 101.3 in Topic 101 of the Linux Server Professional (LPIC-1) exam 101. The objective has a weight of 3. To get the most from the articles in this series, you should have a basic knowledge of Linux and a working Linux system on which to practice the commands covered in this article. Sometimes different versions of a program will format output differently, so your results may not always look exactly like the listings and figures shown here. In particular, the newer upstart and systemd systems are changing many things that might be familiar to users of the traditional System V init process (see for details). This article commences with discussion of the traditional System V init process and its runlevels. We then discuss upstart and systemd which are newer initialization processes. The traditional System V Runlevels define what tasks can be accomplished in the current state (or runlevel) of a Linux system. Traditional Linux systems support three basic runlevels, plus one or more runlevels for normal operation. The basic runlevels are shown in Table 1. Beyond the basics, runlevel usage differs among distributions. One common usage set is shown in Table 2. The Slackware distribution uses runlevel 4 instead of 5 for a full system running the X Window system. Debian and derivatives, such as Ubuntu, use a single runlevel for any multiuser mode, typically runlevel 2. Be sure to consult the documentation for your distribution. When a Linux system starts, the default runlevel is determined from the id: entry in /etc/inittab. Listing 1 illustrates a piece of the file /etc/inittab from a Slackware system set to run in non-graphical multiuser mode. Edit this value if you want your system to start in a different runlevel, say runlevel 4. There are several ways to change runlevels. To make a permanent change, you can edit /etc/inittab and change the default level that you just saw above. If you only need to bring the system up in a different runlevel for one boot, you can do this. For example, suppose you just installed a new kernel and need to build some kernel modules after the system booted with the new kernel, but before you start the X Window System. You might want to bring up the system in runlevel 3 to accomplish this. You do this at boot time by editing the kernel line (GRUB or GRUB 2) or adding a parameter after the selected system name (LILO). Use a single digit to specify the desired runlevel (3, in this case). We’ll illustrate the process with a GRUB example. 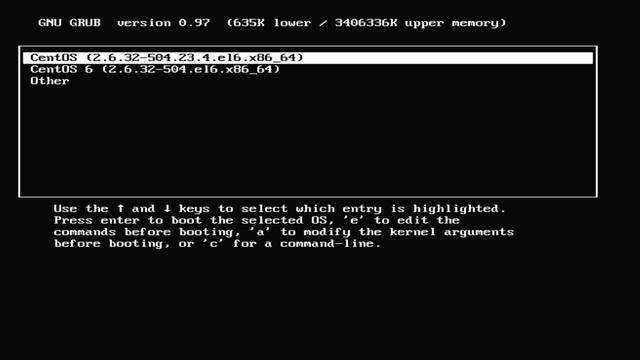 Suppose your /boot/grub/menu.lst file contains the stanza shown in Listing 2 to boot CentOS. We’ve broken the long kernel line for publication using the backslash () character. To bring this system up in runlevel 3, wait till the boot entries are displayed, select this entry and enter ‘e’ to edit the entry. Depending on your GRUB options, you may need to press a key to display the boot entries and also enter ‘p’ and a password to unlock editing. The GRUB screen on our CentOS 6 system looks like Figure 1. In this example, you should now see the root, kernel, and initrd lines displayed. Move the cursor to the line starting with “kernel” and press ‘e’ to edit the line. The GRUB screen on our CentOS 6 system now looks like Figure 2. Finally, move the cursor to the end of the line, and add a space and the digit ‘3’. You may remove ‘quiet’ if you wish, or modify any other parameters as needed. The GRUB screen on our CentOS 6 system now looks like Figure 3. Finally, press Enter to save the changes, then type ‘b’ to boot the system. The steps for doing this using LILO or GRUB 2 differ from those for GRUB, but the basic principle of editing the way the kernel is started remains. Even GRUB screens on other systems or other distributions may look quite different to those shown here. Prompts will usually be available to help you. Once you have finished your setup work in runlevel 3, you will probably want to switch to runlevel 5. On a traditional System V init system, you do not need to reboot the system. You can use the telinit command to switch to another runlevel. Use the runlevel command to show both the previous runlevel and the current one. If the first output character is ‘N’, the runlevel has not been changed since the system was booted. Listing 3 illustrates verifying and changing the runlevel. After you enter telinit 5telinit5 you will see several messages flash by and your display will switch to the configured graphical login screen. 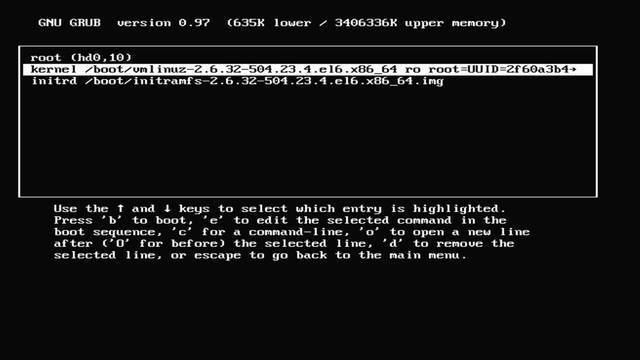 Open a terminal window and verify that the runlevel has been changed as shown in Runlevel 2. If you use the ls command to display a long listing of the telinit command on a system that uses System V init, such as Slackware 37, you will see that it really is a symbolic link to the init command. We illustrate this in . If your system uses upstart of systemd this will probably not be the case. The init executable knows whether it was called as init or telinit and behaves accordingly. Since init runs as PID 1 at boot time, it is also smart enough to know when you subsequently invoke it using init rather than telinit. If you do, it will assume you want it to behave as if you had called telinit instead. For example, you may use init 5init5 instead of telinit 5 to switch to runlevel 5. In contrast to personal computer operating systems such as DOS or Windows, Linux is inherently a multiuser system. However, there are times when that can be a problem, such as when you need to recover a major filesystem or database, or install and test some new hardware. Runlevel 1, or single-user mode, is your answer for these situations. The actual implementation varies by distribution, but you will usually start in a shell with only a minimal system. Usually there will be no networking and no (or very few) daemons running. On some systems, you must authenticate by logging in, but on others you go straight into a shell prompt as root. Single-user mode can be a lifesaver, but you can also destroy your system, so always be careful whenever you are running with root authority. Reboot to normal multiuser mode as soon as you are done. As with switching to regular multiuser runlevels, you can also switch to single-user mode using telinit 1telinit1. As noted in Table 1, ‘s’ and ‘S’ are aliases for runlevel 1, so you could, for example, use telinit stelinits instead. While you can use telinit or init to stop multiuser activity and switch to single-user mode, this can be rather abrupt and cause users to lose work and processes to terminate abnormally. The preferred method to shut down or reboot the system is to use the shutdown command, which first sends a warning message to all logged-in users and blocks any further logins. It then signals init to switch runlevels. The init process then sends all running processes a SIGTERM signal, giving them a chance to save data or otherwise properly terminate. After 5 seconds, or another delay if specified, init sends a SIGKILL signal to forcibly end each remaining process. By default, shutdown switches to runlevel 1 (single-user mode). You may specify the -h option to halt the system, or the -r option to reboot. A standard message is issued in addition to any message you specify. The time may be specified as an absolute time in hh:mm format, or as a relative time, n, where n is the number of minutes until shutdown. For immediate shutdown, use now, which is equivalent to +0. If you have issued a delayed shutdown and the time has not yet expired, you may cancel the shutdown by pressing Ctrl-c if the command is running in the foreground, or by issuing shutdown with the -c option to cancel a pending shutdown. Listing 4 shows several examples of the use of shutdown, along with ways to cancel the command. The system is going down for maintenance in 5 minutes! The system is going down for halt in 348 minutes! Notice in the last example that our broadcast message came out at 18:11, but we asked for shutdown at 23:59, some 6.5 hours later. The traditional System V implementation of shutdown, does not send a warning message if the shutdown is more than 15 minutes away. Rather it waits till 15 minutes before the scheduled shutdown then sends the message. Listing 5 shows a System V example on Slackware 37 and also shows the use of the -t option to increase the default delay between SIGTERM and SIGKILL signals from 5 seconds to 60 seconds. The system is going DOWN to maintenance mode in 15 minutes! If you do cancel a shutdown, you should use the wall command to send a warning to all users alerting them to the fact that the system is not going down. The wall command either takes a warning on the command line or sends a message from a file. A quick way of sending a multi-line message is to use echo -eecho-e and pipe the output to wall. We illustrate this in . As we said earlier, it is also possible to use telinit (or init) to shut down or reboot the system. As with other uses of telinit, no warning is sent to users, and the command takes effect immediately, although there is still a delay between SIGTERM and SIGKILL signals. For additional options of telinit, init, and shutdown, consult the appropriate man pages. If you don’t want to upset your users with sudden system outages, you need to notify them using wall and all other means at your disposal. You should know about a few more commands related to shutdown and reboot. The haltcommand halts the system. The poweroff command is a symbolic link to the halt command, which halts the system and then attempts to power it off. The rebootcommand is another symbolic link to the halt command, which halts the system and then reboots it. If any of these are called when the system is not in runlevel 0 or 6, then the corresponding shutdown command will be invoked instead. For additional options that you may use with these commands, as well as more detailed information on their operation, consult the man page. By now, you may be wondering why pressing Ctrl-Alt-Delete on some systems causes a reboot, or how all this runlevel stuff is configured. Remember the id field in /etc/inittab that we saw earlier? Well, there are several other fields in /etc/inittab, along with a set of init scripts in directories such as rc1.d or rc5.d, where the digit identifies the runlevel to which the scripts in that directory apply. shows the full inittab from our Slackware 37 system. #        the system in a certain run‑level. #System initialization (runs when system boots). #Script to run when going single user (runlevel 1). #Script to run when going multi user. #What to do at the "Three Finger Salute". #Runlevel 0 halts the system. #Runlevel 6 reboots the system. #What to do when power fails. #If power is back, cancel the running shutdown. #Runlevel 4 also starts /etc/rc.d/rc.4 to run a display manager for X.
is a unique identifier of one to four characters. Older versions limited this to two characters, so you may see only two characters used. lists the runlevels for which the action for this id should be taken. If no runlevels are listed, do the action for all runlevels. describes which of several possible actions should be taken. tells which process, if any, should be run when the action on this line is performed. Some of the common actions that may be specified in /etc/inittab are shown in . See the man pages for inittab for other possibilities. respawn Restart the process whenever it terminates. Usually used for getty processes, which monitor for logins. wait Start the process once when the specified runlevel is entered and wait for its termination before init proceeds. once Start the process once when the specified runlevel is entered. initdefault Specifies the runlevel to enter after system boot. ctrlaltdel Execute the associated process when init receives the SIGINT signal, for example, when someone on the system console presses CTRL-ALT-DEL. Listing 10 shows just the entry for Ctrl-Alt-Delete from . So now you see why pressing Ctrl-Alt-Delete causes the system to be rebooted. In this example, init will run the /etc/rc.d/M script (or command) whenever runlevel 2,3,4, or 5 are entered. init will wait until this command completes before doing anything else. These scripts used by init when starting the system, changing runlevels, or shutting down are typically stored in the /etc/init.d or /etc/rc.d directory. A series of symbolic links in the rcn.d directories, one directory for each runlevel n, usually control whether a script is started when entering a runlevel or stopped when leaving it. These links start with either a K or an S, followed by a two-digit number and then the name of the service. Some examples from an older system are shown in Listing 9.
root@pinguino ~find /etc ‑path "rc[0‑9].d/?? ?au"
Here you see that the audit and autofs services have Knn entries in all runlevels and Snn entries for both in runlevels 3 and 5. The S indicates that the service is started when that runlevel is entered, while the K entry indicates that it should be stopped. The nn component of the link name indicates the priority order in which the service should be started or stopped. In this example, audit is started before autofs, and it is stopped later. Since the K and S links usually link to the same script, the script knows whether it is entering or leaving a level by examining the link name by which it was called. However, Slackware uses a slightly different approach. as shown in . Notice that the /etc/rc[0-9].d directories are all empty. Entering a particular runlevel is controlled by a script such as the script to go multiuser, /etc/rc.d/rc.M which is used when entering run levels 2, 3, 4, or 5. Compare the /etc/rc.d/rc.autofs script with the /etc/rc.d/rc2.d/K72autofs and /etc/rc.d/rc4.d/S28autofs symbolic links pointing to /etc/init.d/autofs in the previous example. Consult the init and inittab man pages for more information. As we have seen here, the traditional method of booting a Linux system is based on the UNIX System V init process. It involves loading an initial RAM disk (initrd) and then passing control to a program called init, a program that is usually installed as part of the sysvinit package. The init program is the first process in the system and has PID (Process ID) 1. It runs a series of scripts in a predefined order to bring up the system. If something that is expected is not available, the init process typically waits until it is. While this worked adequately for systems where everything is known and connected when the system starts, modern systems with hot-pluggable devices, network file systems, and even network interfaces that may not be available at start time present new challenges. Certainly, waiting for hardware that may not come available for a long time, or even just a relatively long time, is not desirable. In the following sections of this article we will describe two alternatives to System V init, upstart and systemd. If you are not sure what system initialization you have, remember that the first process started on your system has Process Id (PID) 1. Find out which program is running as PID1. If it’s called “init” then figure out which package provides it. shows how to do this on several systems. With both upstart and systemd, vestiges of System V Init remain, particularly /etc/fstab and a skeletal /etc/inittab. The concept of runlevel is not directly supported. System V commands such as telinit are supported, but their function is mapped internally into activation and deactivation of upstart jobs or systemd units. Needless to say, the mapping may sometimes be less than perfect, so if you boot into runlevel 3 and then use telinit to switch to runlevel 5, your system may or may not work exactly as it would had you rebooted. The “SysVinit to Systemd Cheatsheet” (see Resources) can help you map the concepts and commands from System V init to systemd. A new initialization process called upstart was first introduced in Ubuntu 6.10 (“Edgy Eft”) in 2006. Fedora 9 through 14 and Red Hat Enterprise Linux (RHEL) 6 use upstart, as do distributions derived from these. Upstart has now supplanted the init process in Ubuntu among others, although vestiges of init remain and the full power of upstart may not be realized for some time yet. In contrast to the static set of init scripts used in earlier systems, the upstart system is driven by events. Events may be triggered by hardware changes, starting or stopping or tasks, or by any other process on the system. Events are used to trigger tasks or services, collectively known as jobs. So, for example, connecting a USB drive might cause the udev service to send a block-device-added event, which would cause a defined task to check /etc/fstab and mount the drive if appropriate. As another example, an Apache web server may be started only when both a network and required filesystem resources are available. The upstart initialization program replaces /sbin/init. Upstart jobs are defined in the /etc/init directory and its subdirectories. The upstart system will currently process /etc/inittab and System V init scripts. On systems such as recent Fedora releases, /etc/inittab is likely to contain only the id entry for the initdefault action. Recent Ubuntu systems do not have /etc/inittab by default, although you can create one if you want to specify a default runlevel. Upstart also has the initctl command to allow interaction with the upstart init daemon. This allows you to start or stop jobs, list jobs, get status of jobs, emit events, restart the init process, and so on. shows how to use initctl to obtain a list of upstart jobs on a Fedora 13 system. To learn more about upstart, see Related topics. Another new initialization system called systemd is also emerging. Systemd was developed by Lennart Poettering in early 2010. He described the rationale and design in a blog post (see Related topics. Early adopters were Fedora 15, openSUSE 12.1 and Mandriva 2011 among others. With release 15.04 Ubuntu has switched from upstart to systemd. Many daemon processes communicate using sockets. In order to gain speed and enhance parallelism in the system startup, systemd creates these sockets at startup, but only starts the associated task when a connection request for services on that socket is received. In this way, services can be started only when they are first required and not necessarily at system initialization. Services that need some other facility will block until it is available, so only those services that are waiting for some other process need block while that process starts. Extending the idea of waiting for services systemd uses autofs to define mount points, so the mount point for a file system is available, but the actual mount may be delayed until some process attempts to open a file on the file system or otherwise use it. These ideas not only delay startup of services until needed, they also reduce the need for dependency checking between services, as the interface for the service can be ready long before the service itself needs to be available. Service units are daemons that can be started, stopped, restarted, reloaded. Socket units encapsulate a socket in the file-system or on the Internet. Device units encapsulate a device in the Linux device tree. Mount units encapsulate a mount point in the file system hierarchy. Automount units encapsulate an automount point in the file system hierarchy. Target units group other units together, providing a single control unit for multiple other units. Snapshot units reference other units and can be used to save and roll back the state of all services and units of the init system (for example, during suspend). Units are configured using a configuration file, which includes the unit type as a suffix. For example, cups.service, rpcbind.socket or getty.target. The location of system configuration files (for example, /etc/systemd/system) can be determined by using the pkg-config command as shown in , which shows the location on a Fedora 17 system. Systemd also checks /usr/local/lib/systemd/system and /usr/lib/systemd/system for configuration information. The systemctl command allows you to interrogate and control the systemd daemon, including starting and stopping units or listing their status. illustrates the use of systemctl to display the status of some of the systemd units on my Fedora 22 system. ACTIVE = The high‑level unit activation state, i.e. generalization of SUB. SUB    = The low‑level unit activation state, values depend on unit type. 164 loaded units listed. Pass ‑‑all to see loaded but inactive units, too. To show all installed unit files use 'systemctl list‑unit‑files'. The last part of the unit name (such as device, path, target) is the unit type. The systemctl command allows you to interrogate and control the system units. We show a few examples in where we first interrogate the SSH server daemon (sshd.service). Then we stop it and check the status again. Finally, we start it again. Jul 15 10:24:03 atticf20 systemd: Started OpenSSH server daemon. Jul 15 10:24:03 atticf20 sshd: Server listening on 0.0.0.0 port 22. Jul 15 10:24:03 atticf20 sshd: Server listening on :: port 22. Jul 15 16:06:28 atticf22 systemd: Stopped OpenSSH server daemon. This completes your introduction to Linux runlevels, shutdown, and reboot. 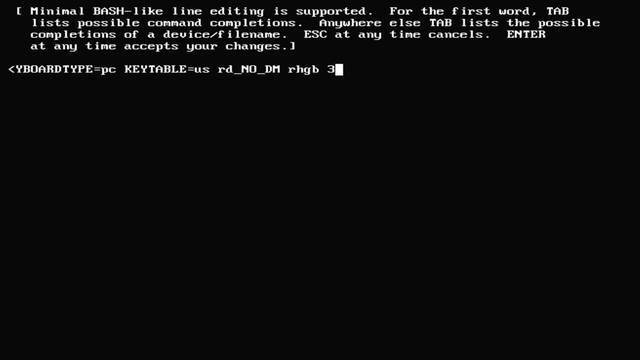 Linux BootPrompt-HowTo The Linux BootPrompt-HowTo helps you understand boot parameters. Upstart overview See the Upstart overview for more information on upstart. Rethinking PID 1 See Rethinking PID 1 for more information on the rationale for systemd. SysVinit to Systemd Cheatsheet The SysVinit to Systemd Cheatsheet helps you map between System V concepts and commands and their systemd counterparts.